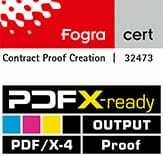 PSO stands for “ProcessStandard Offset Printing”, a standard that was developed by Fogra and the German Printing and Media Industry together. The ProcessStandard Offset Printing is a set of standards for offset printing. With test equipment and control by measurments as described in the PSO, the printing process of the data delivery and data preparation on the platemaking is monitored, controlled and checked.